函数式语言里面的数据是不可修改的。这使得多个线程可以在不用锁的情况下并发地访问这个数据。因为数据不会改变，所以根本不需要上锁。随着多核处理器的越发流行，函数式语言对并发语言的简化可能是它最大的优点。如果所有这些听起来对你来说很有吸引力而且你准备来学学函数式语言，那么你要有点心理准备。许多人觉得函数式语言并不比面向对象的语言难，它们只是风格不同罢了。而花些时间学了函数式语言之后可以得到上面说到的那些好处，我想还是值得的。比较流行的函数式语言有:Clojure, Common Lisp, Erlang, F#, Haskell, ML, OCaml, Scheme, Scala. Clojure和Scala是Java Virtual Machine (JVM)上的语言. 还有一些其它基于JVM的语言: Armed Bear Common Lisp (ABCL), OCaml-Java and Kawa (Scheme). “我想把这就几个元素包含在里面： C (C#), L (Lisp) and J (Java). 所以我想到了 Clojure, 而且从这个名字还能想到closure;它的域名又没有被占用;而且对于搜索引擎来说也是个很不错的关键词，所以就有了它了." Clojure是一个开源语言， licence:Eclipse Public License v 1.0 (EPL). 这是一个非常自由的Licence. 关于EPL的更多信息看这里:http://www.eclipse.org/legal/eplfaq.php . 运行在JVM上面使得Clojure代码具有可移植性，稳定性，可靠的性能以及安全性。同时也使得我们的Clojure代码可以访问丰富的已经存在的java类库：文件 I/O, 多线程, 数据库操作, GUI编程, web应用等等等等. lojure里面的每个操作被实现成以下三种形式的一种: 函数(function), 宏(macro)或者special form. 几乎所有的函数和宏都是用Clojure代码实现的，它们的主要区别我们会在后面解释。Special forms不是用clojure代码实现的，而且被clojure的编译器识别出来. special forms的个数是很少的， 而且现在也不能再实现新的special forms了. 它们包括:catch,def,do,dot ('. '),finally,fn,if,let,loop,monitor-enter,monitor-exit,new,quote,recur,set!,throw,try 和var. Clojure是Lisp的一个方言. 但是Clojure对于传统的Lisp有所发展。比如, 传统Lisp使用car 来获取链表里面的第一个数据。而Clojure使用first。有关更多Clojure和Lisp的不同看这里 http://clojure.org/lisps. Clojure里面大量之用了延迟计算. 这使得只有在我们需要函数结果的时候才去调用它. "懒惰序列" 是一种集合，我们之后在需要的时候才会计算这个集合里面的元素. 这使得创建无限集合非常高效. Clojure代码很难理解么？想想每次你看到java代码里面那些复杂语法比如: if,for , 以及匿名内部类, 你需要停一下来想想它们到底是什么意思（不是那么的直观），同时如果想要做一个高效的Java工程师，我们有一些工具可以利用来使得我们的代码更容易理解。同样的道理，Clojure也有类似的工具使得我们可以更高效的读懂clojure代码。比如：let,apply,map,filter,reduce 以及匿名函数 ... 所有这些我们会在后面介绍. Clojure code for your own library and application projects will typically reside in its own directory (named after the project) and will be managed by the Leiningen project management tool. Leiningen (or "lein" for short) will take care of downloading Clojure for you and making it available to your projects. To start using Clojure, you don't need to install Clojure, nor deal with jar files or the java command — just install and use lein (instructions on the Leiningen homepage, linked to above). To create a new application project, do "lein new app my-app"
For more about getting started, see http://dev.clojure.org/display/doc/Getting+Started. <pre><code class="clojure hljs">; This is Clojure code. ;   'separator'. Like Perl's 'join'. bindings that are local to a function, and bindings that are local to a given form. Function parameters are bound to Vars that are local to the function. within the scope of a <code>binding</code> call. if accessed from another thread. that are bound to the scope within the statement. Its first argument is a vector containing name/expression pairs. are assigned to the names on their left. These Vars can be used in the binding of other Vars declared within the vector. contain the Var(s) that are executed only within the <code>let</code> scope. by the declarations in the <code>let</code>'s vector. the same Var names, called from inside that scope. the global Var bindings revert to their previous values. using <code>binding</code> have their own naming convention. begin and end with an asterisk. Functions that use these bindings are affected by their values. <code>def</code>, <code>defn</code>, <code>let</code>, <code>binding</code>, and <code>println</code>. f1 within the <code>let</code> statement. The value of v in f1 is 1, not 2.
v is bound to the initially declared binding, 1.
new execution thread so v is bound to the new value, 4, in the global scope. practice. It is presented in f4's definition for demonstration purposes. <pre><code class="clojure hljs">; The next line uses an anonymous function that adds 3 to its argument. ; and then use the contains? function on the set as follows. case the new item(s) are added to the front. <pre><code class="clojure hljs">(get stooges 1 "unknown") ; -> "Larry"
(get stooges 3 "unknown") ; -> "unknown"
<pre><code class="clojure hljs">(stooges "Moe") ; -> "Moe"
<pre><code class="clojure hljs">The flavor of green popsicles is apple. The flavor of purple popsicles is grape. The flavor of red popsicles is cherry. ; a function that is then bound to "make". (make vehicle) ; -> "Toyota"
; Using java.lang.Math static method pow. "returns a String parting in a given language"
; condp is similar to a case statement in other languages. ; It is described in more detail later. ; parameter "language" is set to "en", "es" or something else. no longer anonymous and enables it to call itself recursively. ; the sum of its two arguments is an even number. ; a function that is then bound to "my-composition". ; a function that is then bound to "times2". and its derivative for given x values. The polynomials are described by a vector of their coefficients. to define functions for a specific polynomial and its derivative. Finally, we'll demonstrate using the functions. from an inclusive lower bound to an exclusive upper bound. and the upper bound defaults to infinity. with the given coefficients for a given value x"
; For example, if coefs contains 3 values then exponents is (2 1 0). ; and sum those results. ; coefs go into %1 and exponents go into %2. ; multiplying all but the last coefficient by its corresponding exponent. ; The extra exponent will be ignored. ; a function that is then bound to "memo-f". ; Note the use of an underscore for the binding that isn't used. (.. calendar getTimeZone getDisplayName) ; -> "Central Standard Time"
(.format formatter (.getTime calendar)) ; -> "Aug 1, 1981"
; while the Thread object is being created. ; output is "Hello, World!" ; Clojure collections implement clojure.lang.IPersistentCollection. (or (coll? obj) ; Clojure collection? (instance? java.util.Collection obj))) ; Java collection? ; then divide by the number of items in it. followed by a period for each remaining item"
; Execute the when-let body only if the collection isn't empty. ; the number of items in the collection. (summarize ["Moe" "Larry" "Curly"]) ; -> Moe..
(instance? String temperature) "invalid temperature"
in a way that doesn't consume stack space"
"square the argument and divide by 2"
; for the values 0 through infinity. ; Note that the head of this sequence is being held in the binding "f-seq". ; This will cause the values of all evaluated items to be cached. ; Force evaluation of the first item in the infinite sequence, (f 0). ; Force evaluation of the first three items in the infinite sequence. ; only (f 1) and (f 2) will be evaluated. ; are cached while in this function and then garbage collected. <pre><code class="clojure hljs">(let [obj1 "foo"
; evaluating all the expressions in its body. ; second item in the collection which isn't used. ; should be extracted by destructuring. ; into which the values are placed. <pre><code class="clojure hljs">(clojure.string/join "$" [1 2 3]) ; -> "1$2$3"
(su/join "$" [1 2 3]) ; -> "1$2$3"
<pre><code class="clojure hljs">(join "$" [1 2 3]) ; -> "1$2$3"
; See the screenshot that follows this code. :doc "Returns a seq of the items in coll in reverse order. Not lazy." ; Assume the only account data that can change is its balance. ; We need to be able to add and delete accounts to and from a map. ; for the purpose of assigning the next one. "creates a new account, stores it in the account map and returns it"
; The id for the new account is one higher than the last one. ; Create the new account with a zero starting balance. ; Add the new account to the map of accounts. ; Return the account that was just created. "adds money to an account; can be a negative amount"
(if (>= (+ @balance-ref amount) 0) ; sufficient balance? "removes money from an account"
; A withdrawal is like a negative deposit. "prints information about a single account"
; the transaction started in report. "prints information about any number of accounts"
; to handle exceptions not caught in other threads. 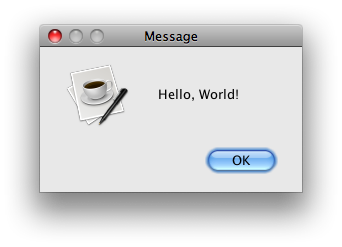 ; Just print the message in the exception. ; to transfer $50 to Tami's account. (.start thread) ; will sleep in deposit function twice! ; (simulated with sleep calls), the next call will complete first. ; to complete the transfer. ; and the previous change isn't committed. <p><code>send</code> 函数把一个 action 分配给一个 Agent， 并且马上返回而不做任何等待。 这个action会在另外一个线程(一般是由一个线程池提供的)上面单独运行。 当这个action运行结束之后，返回值会被设置给这个Agent。<code>send-off</code> 函数也类似只是线程来自另外一个线程吃。</p. ; that will become the new value of the Agent. ; Change the root binding of the Var in two ways. ; Change the Ref in two ways. ; so the watcher isn't notified. ; notified of one change this Ref ... the last one. (alter my-ref (fn [_] "r4"))) ; And now one more. ; Change the Atom in two ways. ; Wait for all the actions sent to the watcher Agent to complete. ; each reference object that was watched. 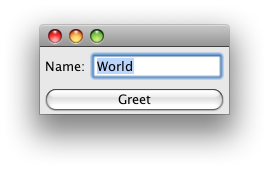 \# Note the hyphen at the beginning of the function name! 退出 REPL (ctrl-d 或者 ctrl-c). 运行 "javac -cp classes Main.java". ; Tests can be written in separate functions. ; and an optional message. ; Tests can verify that a specific exception is thrown. ; to the functions they test as metadata. ; multiple sets of arguments to it, but no message. ; into the predicate template and evaluated. ; Run all the tests in the current namespace. ; This includes tests that were added as function metadata using with-test. ; Other namespaces can be specified as quoted arguments. Clojure plugins for many editors and IDEs are available. For emacs there is clojure-mode and swank-clojure, both at https://github.com/technomancy/swank-clojure. swank-clojure uses the Superior Lisp Interaction Mode for Emacs (Slime) described at http://common-lisp.net/project/slime/. For Vim there is VimClojure at http://www.vim.org/scripts/script.php?script_id=2501. For NetBeans there is enclojure at http://enclojure.org/. For IDEA there a "La Clojure" at http://plugins.intellij.net/plugin/?id=4050. For Eclipse there is Counter Clockwise at http://dev.clojure.org/display/doc/Getting+Started+with+Eclipse+and+Counterclockwise. Clojure 可以创建基于Swing的GUI程序。下面是一个简单的例子， 用户可以输入他们的名字，然后点击“Greet：按钮，然后它会弹出一个对话框显示一个欢迎信息。可以关注一下这里我们使用了proxy 宏来创建一个集成某个指定类 (JFrame )并且实现了一些java接口 (这里只有ActionListener 一个接口)的对象。. \# and possibly some Clojure contrib JAR files. ; The classname below must be in the classpath. ; one for each record in the result set. ; their values are the column values for that result set row. clj-record 提供了一个类似 Ruby on Rails的ActiveRecord的数据库访问包. 更多关于它的信息看这里：http://github.com/duelinmarkers/clj-record/tree/master.